Andrew has worked in theatre, film and TV for over 15 years. His voice is deep and grounded, and can be served with a sprinkling of gravitas or lashes of comic timing. On stage in 2017, he appeared in Sport For Jove’s Cyrano de Bergerac after spending 2016 playing Mr Walt in the World Premiere of John Cleese’s Fawlty Towers Live where he was also kept busy understudying the lead role of Basil. His other theatre credits include Jeff in The Lunar Effect (Old Fitz Theatre, 2015), Gordy in Philip Ridley’s Shivered (Mad March Hare, 2015), Bottom in Peter Evans’ production of A Midsummer Nights Dream (Bell Shakespeare, 2013) and Alan in Lee Lewis’ national touring production Moliere’s The School For Wives (Bell Shakespeare, 2012). 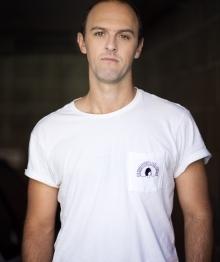 Children across Australia know him as the mischievous Andy from the stage adaptations of Andy Griffiths’ incredibly successful Treehouse Series (2014). Andrew has toured schools around Australia with Bell Shakespeare’s The Players program and is available to teach drama workshops. His self-devised comedy show, Rip Whitening’s SynchroDestiny Experience received the People’s Choice award at the 2010 Sydney Fringe Festival. On screen he is most notable for the lead role of Derek in the award winning independent feature film, Ad Nauseam directed by Nikos Andronicos. Andrew currently shares the role of match day MC on the big screen for Sydney Swans home games at the SCG and has fulfilled similar MC and Announcer roles at sporting events throughout the world. He coaches the Alexandria Dukes Rugby Club in his spare time.